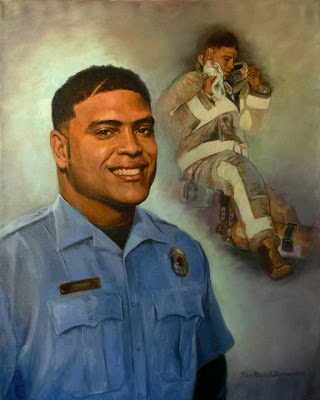 I was honored to have been selected to paint a portrait of this young man who died tragically while fighting a house fire, November 25, 2000. The City Council of Pensacola, FL named the new wing of the Downtown Library in honor of Marvin Maurice Bartholomew and have a prominent location within the atrium, where his portrait will reside, designated for a First Responders Memorial honoring all fallen Firefighters and Police Officers. The Ribbon Cutting Firefighter Memorial Dedication Reception will be held this Friday at 10:00 AM at 239 North Spring Street. The public is welcome.